Salmon and citrus are a natural pairing, and this easy recipe lets the flavors of both shine through. Cook the salmon filets in a piping hot pan to get a good sear on each side. Make a potent, spicy chipotle and lime sauce to spoon on top of the flaky fish, and finally, a zesty avocado and orange salsa. The entire meal takes only half an hour to prepare. This recipe is not only packed with omega-3s, vitamin C, and healthy fats, it's also incredibly flavorful. 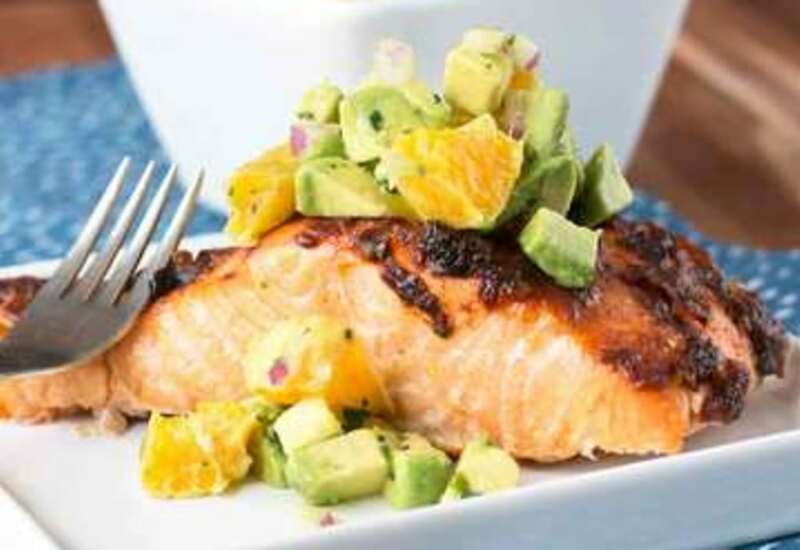 Take a bite of salmon, sauce, orange, and avocado together for a taste explosion in your mouth. If you’re using skinless salmon, continue using the same steps. Make sure your pan is always hot and steaming before adding oil, and allow the oil to heat up before adding the salmon. Be careful not to over-crowd the pan, as it lowers the temperature of the skillet. For best results, cook salmon in batches of 2 to 3 servings. Per Serving: 278 calories; 20g fat; 11.1g carbohydrates; 14g protein; 36mg cholesterol; 1086mg sodium. Very delicious salmon dish with a kick of heat from the cayenne and adobo sauce. The salsa is a refreshing compliment to salmon which does cut down on the spice. Make sure to get that salmon skin very crispy as you will find it more palatable. I've never had chipotle flavored salmon before, and I've been seriously missing out. This recipe was fantastic! I love spicy foods, so the cayenne and adobo was perfect. I wonder how the salmon would taste in a taco? So good, I an't wait to make this again. The chipotle and lime flavors were really bold, but paired well with the salmon. The salmon would probably also be really good to use in tacos. I'll probably try that next! I'm not a huge fan of oranges, but the citrus avocado salsa was a pleasant surprise. A lot of flavor in this dish, I look forward to making it again. Love the flavor of this!! Will definitely make again! Using two chipotle peppers was too much for me, it was really spicy. I think one tablespoon will suffice next time. My husband, on the other hand, thought the heat was perfect. We both loved it and will make again.